Eric VanRaepenbusch, Author-Illustrator, Storyteller, Blogger: Three Ghost Friends and the Battle Boos Now Available! Three Ghost Friends and the Battle Boos Now Available! 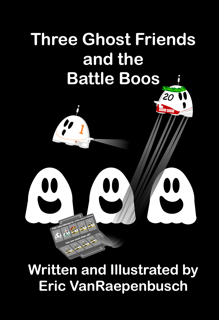 THREE GHOST FRIENDS AND THE BATTLE BOOS is now available in paperback and as an eBook. Read more about how I made the book in a blog post I wrote on THREEGHOSTFRIENDS.COM. Thanks so much for sharing these updates. Allie is remarkable and remains in our daily thoughts and prayers.